New York 2012: Infiniti LE first details | What Car? 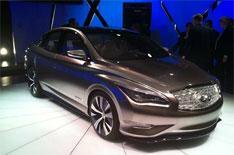 This is the Infiniti LE electric concept car, which was revealed at the 2012 New York motor show. The all-electric saloon is based on the Nissan Leaf, but with several important differences. Infiniti says the production version of the LE will be quicker and more powerful than the Leaf, while also sportier to drive. Infiniti has not commented on how the improved dynamics will impact on the electric car's range the Nissan Leaf has a range of around 75 miles. The LE has a totally different look inside and out. Lexus calls the LE a 'production intent' concept car and says that there will be minimal changes for the production model. Unusual details include a 'double'arch' front grille, and 'crescent-cut' rear pillar. A strong shoulder line flows along the side of the car. The LE has get a totally different interior to its Nissan counterpart, with more emphasis placed on luxury. Prices have yet to be revealed, but the LE will be more expensive than the Leaf when it goes on sale in 2014.